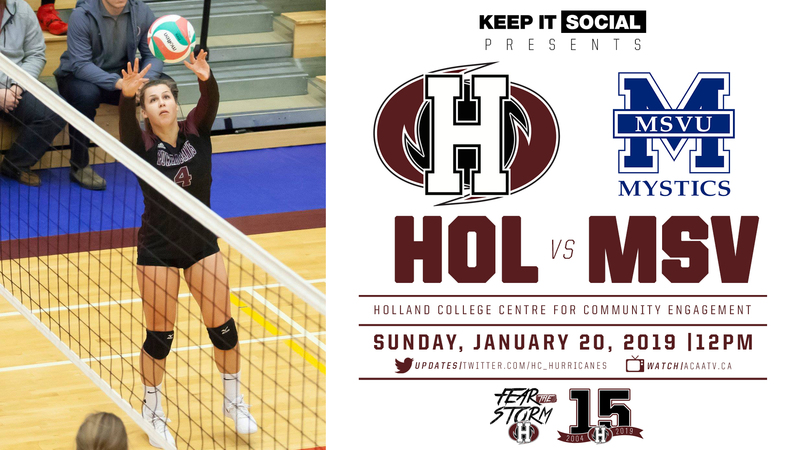 The Holland Hurricanes men’s and women’s volleyball teams will be in action this weekend as they continue their ACAA regular seasons. 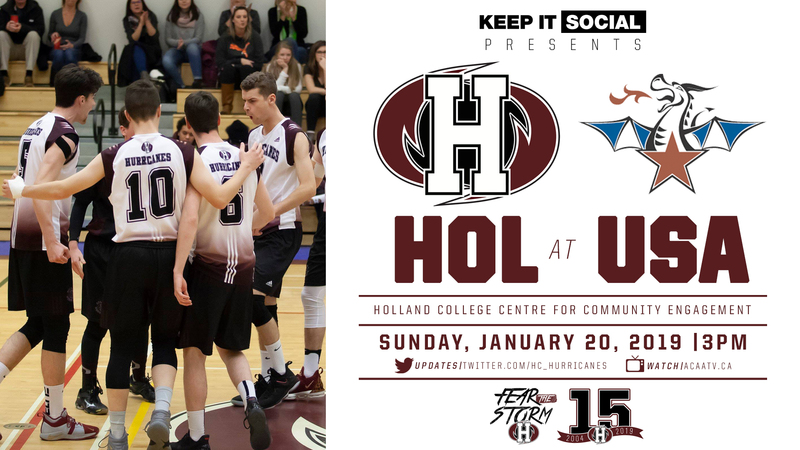 On Saturday, the women will host the St. Thomas Tommies at 2pm at the Holland College Centre for Community Engagement in Charlottetown, PEI, while the Hurricanes men are in Church Point, Nova Scotia where they will visit the Université de Sainte-Anne Dragons at 3pm. Play is scheduled to continue on Sunday at 12pm when the women’s ‘Canes host the MSVU Mystics. 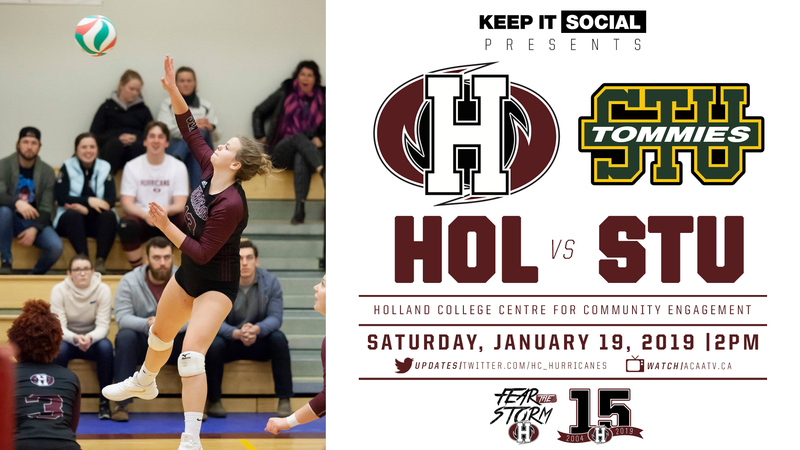 The women’s Hurricanes enter the weekend at 9-3 this season and in second place in the ACAA standings; they trail the MSVU Mystics who are undefeated at 12-0, while the STU Tommies sit in fifth at 6-8. The Hurricanes female Athlete of the Week this week, Zayley Murphy, a first-year player from Conception Bay South, Newfoundland, looks forward to the challenge this weekend will bring. The Hurricanes have split their two meetings with the Tommies this season, first, dropping a November 24 meeting in straight-sets, before winning in five-sets on November 25; both matches were played in Fredericton, NB. The Hurricanes have met the MSVU Mystics just once this season, a match that ended in a fourth set win by the Mystics in Halifax, NS. Third-year middle, Brittany States, knows when you have the top two teams facing each other it is going to be an intense matchup. The men’s Hurricanes will challenge the Université de Sainte-Anne Dragons on Saturday at 3pm; a game that was originally scheduled to be played on Sunday but was pushed ahead due to a potential snowstorm on Sunday. The ‘Canes enter the weekend with a 3-6 record and in third place in the ACAA standings while the Dragons are 1-6 and in fourth. Third-year right side, Jeff MacDonald has been impressed with the play of the Hurricanes so far in 2019. This season the Hurricanes have won two-of-three matches versus the Dragons. First, a straight-sets sweep on November 4 in Church Point before dropping a five-set match in Charlottetown on November 17. The Hurricanes won the last meeting on November 18 in four-sets. All three Hurricanes volleyball games can be seen live at www.acaatv.ca for those that cannot attend the games.